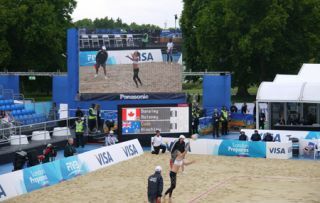 Panasonic gears up for the London Olympics | What Hi-Fi? As one of the official sponsors of the London Olympics, the Japanese electronics giant is providing a huge amount of audio-visual equipment for the games. Equipment being installed on the Olympic site in London includes 45 large LED screens, 200 professional sound systems, 12,000 TV sets, 47in 103in plasma screens, 22 DLP projectors, 1000 professional TV monitors and 30 3D cameras. Panasonic will support the transmission of the Olympic events in high definition, as well as providing the equipment needed for the first ever 3D Olympic broadcasts. At indoor events, Panasonic will install its 103in PDP plasma displays, and for the opening ceremony it will use the PT-DZ21K and PT-DS20K 20,000 Lumens projectors. Coinciding with all that, Panasonic is also launching an app, called Flag Tags, which will allow people across the world to 'share the passion' and show support for their country during the London 2012 Olympic and Paralympic Games. Designed for Facebook and mobiles, Flag Tags allows users to paint their face in national team colours and dedicate their social profile to the chosen team.